For anyone out there not familiar with the history of Color, its initial industry reception, etc., this article sums it up for you. Even more valuable is the comments section where you get some great perspective from two industry experts and technocrats Frank Capria, moderator of the FCP-L, and Mike Curtis, infamous HDforIndies blog-o-phile. Drove to the UPS delivery center in Laurel to pick up my Matrox MXO. This has been a purchase 4 months or so in the making. My setup of a MacBook Pro 17″ Santa Rosa, Dell 2407WFP LCD monitor, Matrox MXO, and Color makes for the most portable and versatile entry level color grading suites for broadcast that smart money can buy. IMHO. Bought the Leopard family pack so I can install 10.5.2 on the laptop and dual 2.7 G5 tower to host the Matrox MXO 2.1.1 driver. Trader Joe’s chicken burrito’s just came out of the oven, so fo those of you interested in reading more about what the Matrox MXO can do, check out the Creative Cow forum. I’ll work on the setup tonite and tomorrow and hopefully will have some pics and first impressions by the weekend. everything I know about color correction. that are still applicable to Color. trouble, there were many more who couldn’t see it, so I put it in two other places. One was on my .Mac site as a podcast, and the other – through the suggestion of Martin Baker – was on a video site I’d never heard of called Vimeo. If I am veering to the “commercial,” I apologize and will desist. Veer away, Mr. Hullfish. And please, veer often! 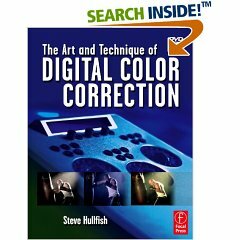 I just received his new book, The Art and Technique of Digital Color Correction, and I’m psyched to have a tome that delves into the theory and technique of the colorist’s dark art with Color as the bell weather application. As an Apple Color Certified Trainer and working Editor / Colorist I’m sure this book will prove to be an invaluable resource. Look forward to reviewing quotes from this book in upcoming posts. And check back for Color video tutorials by yours truly. As far as I know this is the only recording of this song anywhere on the internets as either audio or video. This is our best guess as the title. Alternate title could be Distant Lands but we went with Tell My Mother for good measure. So my 40min DVCam tape spools out but the crowd wants more from Ryan. For his encore he drops this diddy, which he lets us know he hasn’t recorded yet and will be on his new record (wow!). I decided to do a split screen of Chris running through the green room and then the crowd. Trying to add as much of a documentary element to these live performances as we can. Truth be told I was really frustrated with the production of this performance. The wait staff kept walking in front of my camera and at one point people in the audience asked me to move out of their way. The Ram’s Head in Annapolis only holds about 150 people and I guess it’s a testament to Ryan’s fans that they packed it to the brim. Simply put there was no breathing room for me and my hand held PD150. But I couldn’t be happier with how these clips turned out. Heads walking past the camera adds to the raw feeling of the show and to the energy of some of the cuts. Chris did an unbelievable job monitoring the house sound and shooting with his GL2 simultaneously. As hand held camera number three he single handedly saved the show. Thanks Chris! And another round of thanks to Bob Waugh, Rob Timm, and Alex Crotright from 103WRNR for making this show happen. IMHO this is the best Private Artist Showcase to date. Saw posts on the FCP-L where users running Mac OS 10.4.11 and installing YouTube’s Mulit-Upload Tool are experiencing the same difficulties I did. Apparently there can be problems installing with Safari. Users who run Firefox and Mac OS 10.4.11 seem to be free and clear of upload freezes. …of their cover of Paul Simon’s Peace Like A River. I was reluctant, to say the least, my knee jerk “…we don’t have a release” production mindset kicking in. “We need them to sign a release, we need a release from the record company, we need a note from their parents to let them ride on the bus…” I threw everything plus the kitchen sink at Jon. He would have none of it. And 103WRNR would take care of everything. Having just finished a whirlwind tour of Boston and then Santa Monica to complete my Final Cut Pro 6 and Motion 3 training certifications from Apple, I woke up a bit jet lagged, swung by Mom & Dad’s, Dad faithfully handed me his PD150 (fully charged overnight) and I headed to the Ram’s Head on West Street.First time shooting there and I walk through the door and see Chris Hartman working house sound. I played baseball with Chris back in High School, and we pick up where we must’ve left off on the field and get to lighting the stage. Chris also brought his GL2 and is happy enough to lend it to the production camera for the wide lock down. I make sure all three cameras (PD150, GL2, and HV20 which recorded HDV in 24f cinematic mode) are set to anamorphic. Then I scout the layout and figure out positions for me and Jon to get good shots and be least intrusive for the audience. Mid set up, Dad swung by with an extra tape for Chris’s camera that we hadn’t expected to be there (thanks again Dad!). Just make sure you start the cameras before they come on and don’t stop recording no matter what. We’re on TV all the time,” I remember telling Jon, as we say in the biz. 5 minutes later Spoon takes the stage, 28 minutes later we’re with Alex Cortright shooting the post performance interview (soon to come), and two days later I was instructing at Michael Rosenblum’s Travel Channel Academy at Discovery’s headquarters in Silver Spring, MD. I took a cut of The Underdog with me back to Santa Monica in November for the Color T3. Found out there’s a few gotchas sending multiclip sequences to Color and ended up accidentally deleting the media I had intended to use for my presentation at the end of the seminar. Ok, so my internet connection is really slow (thank you Comcast!) and the Jose Gonzalez DV NTSC anamorphic quicktime, weighing in at 771.6 mb, still hasn’t uploaded. So in the meantime I’ve updated the blog to include a new page with a copy of my resume for your entertainment. Also, I’ve updated the blog title to pro•active•ly. Why the suffix? It’s an ode to my English major roots. Think of that extra -ly as a metaphor for the extra tidbits of info I might tack on to a rather mundane Compressor explanation, or the extra tangent that leads to a link to the Videospace widget. So boys and girls, it looks like we can upload longer videos using HDV quicktimes! Makes me feel a bit silly that I down-converted the Jose Gonzalez piece from a 1440×1080 ProRes 422 timeline to DV NTSC for upload to YouTube. Ends up I could have had Color render my media as HDV instead of ProRes 422 and then simply exported a self contained quicktime movie to upload directly to YouTube.